Tang Yuan 湯圓 are boiled soft chewy balls normally made with glutinous rice flour. * osmanthus flowers or gui hwa 桂花 are fragrant edible yellow flowers from China, used mainly for tea or make into fragrant syrup for desserts. The dried flowers are not easily available in UK, can get from Ebay or some far east tea supplier website. I got mine from Hong Kong. Put glutinous flour in a mixing bowl, pour in half the water, mix then gradually mix in the rest of the water bit by bit while mixing with hand till no dry flour left and dough is not sticky to hand. If too wet add a bit more glutinous flour, too dry add few more drops of water. Boil a pan of water (about 3 - 4 cups). Take a lump of the dough, roll between palms into a sausage, break into small pieces then roll each tiny piece into a ball. Drop the dough ball straight into the boiling water. Continue forming the dough ball till finished. 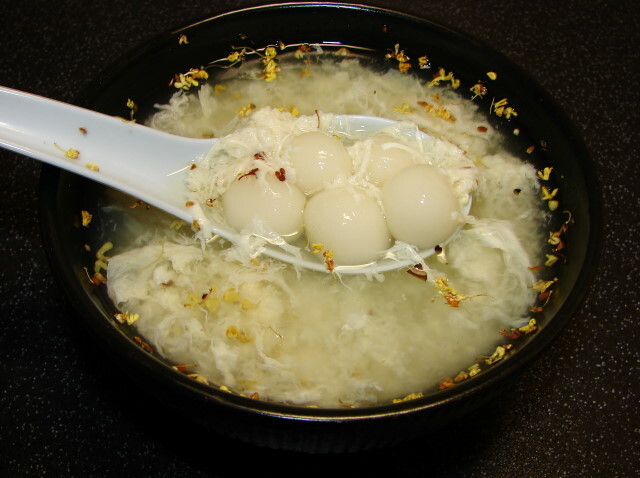 When the balls float onto the surface they are cooked. Remove balls and put into a pan of cold water. When all the balls are cooked and removed. Discard the boiling water. If you don't mind you can use this water for the soup base but I find it a little thick for my taste. Fill the same sauce pan with some fresh boiling water about 3 cups. Mix fermented rice with a little water to make sure rice grains are separated and not lumpy. Add to the pan of boiling water. When the liquid is boiling rapidly add in the cooked balls, add enough sugar to taste. Boil for a little while till liquid is boiling rapidly again. Pour in the beaten eggs in a thin long stream while stirring the liquid to form fine egg ribbons. Heat off soon as the egg is poured in. Stir in ginger juice and sprinkle on a little dried osmanthus flowers.